This is simply a stunning dish. I have made no secret of the fact that Chinese food is my absolute favourite. 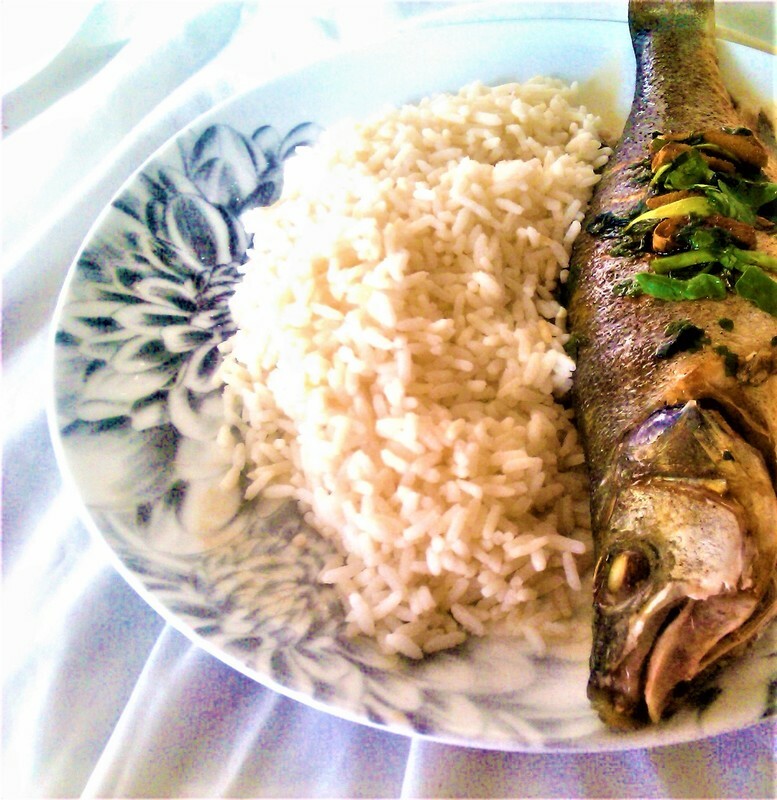 Chinese Steamed Fish is my third favourite Chinese dish. Steaming is a classic method of cooking Fish in Chinese cuisine. The Fish is steamed to retain it's moisture and produces a wonderful silky texture. You don't have to to use Sea Bass. I rarely buy the Fish because it's usually very pricey, but I think it's the best Fish for Chinese cooking. 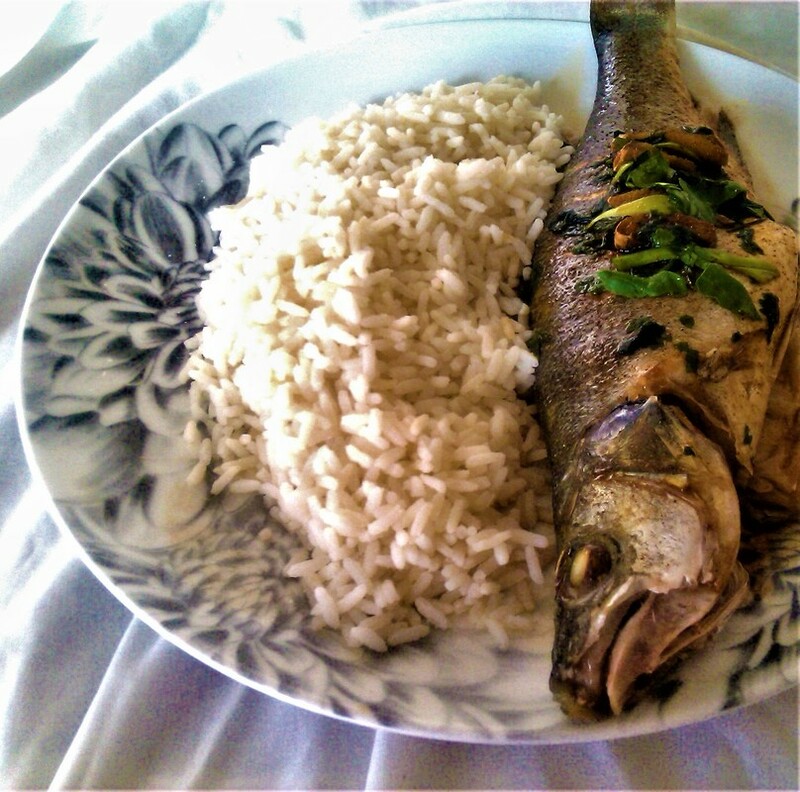 Sea Bream, Snapper, Walleye, Coral and Rainbow Trout are decent alternatives. I steam bake the fish because I've never had any luck in stove stop steaming, and in fact I think this produces the best results. You place the Fish in a baking dish after seasoning; and then place the dish into a baking tray that you fill with water, cover with foil and leave to steam bake for 30 minutes or however long is required for the type of Fish. ​Season the Fish with salt and white pepper; first pat dry the Fish with paper towels, cut three or four slits on the top side of the fish, and lightly rub vegetable oil on each side. Sprinkle salt on each side of the fish and inside the cavity. Finish with a sprinkling of white pepper-this is steam baked slit side up. Leave Fish to sit for 15 minutes to absorb the salt and pepper. ​Place the Fish in a baking dish and place the baking dish inside a baking tray that will hold water. Take a bunch of spring onions and place them around the fish and in the cavity. Take a chunk of ginger and cut 8 thin slices and place them inside the cavity. Last but not east take a small garlic head and make a slit in the garlic and place it inside the fish, it won't completely fit but will flavour the fish as it steams. Cover with foil and steam bake for 30 minutes. Make the sauce to pour over the Fish while the Fish bakes. Add 1/2 cup of water to a pot and bring to a boil. Then add 1 and a 1/2 cups of soy sauce, 3 or 4 tablespoons of sugar, 1 onion sliced in centre, 1 garlic bulb halved, 1/2 tsp of pepper, 8 chunks/slices of ginger, 1/2 tsp of rice wine vinegar, 1/4 tsp of sesame oil, and a large bunch of Spring Onions. Boil then once thickened, simmer and reduce to taste and consistency. Strain the sauce through a sieve. This sauce can be used for other Asian seafood fishes. Once baked pour the excess liquid out of the fish, garnish with a few thin slices of ginger and a few thin slices of spring onions. Sprinkle some Cilantro over the garnish, you can also use Parsley as an alternative. 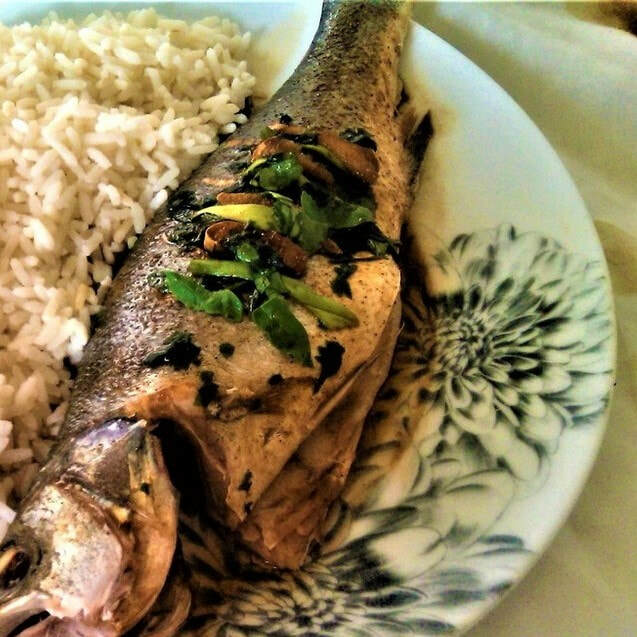 Pour the sauce over the Fish and serve with white steamed rice.